Special tour program for those not used to the winter sports and would just like to see and enjoy the snow, this is the right tour for you. Make memorable pictures for you and your friends or family members on the white dazzling snow. It would be one of a great experience during your stay. Optionally you can enjoy snow slide with your lovely kids, too. If you want to go skiing or snowboarding, you are always welcomed to do that. Just get upgraded your tour on the day. As the following this is the progress of the Korea ski tour korea program. When you arrive at the ski resort korea for your Ski tour, you can see the mountains covered with white snow from the car window. Between the mountains you can see skiers going down the slopes as they move side to side in a zigzag movement but, when you look closer you can also see young skiers sliding between adults as they are sliding smoothly out from between them. As you are feeling nervous, anxiously you are about to learn something new right? But, you don’t have to feel nervous. 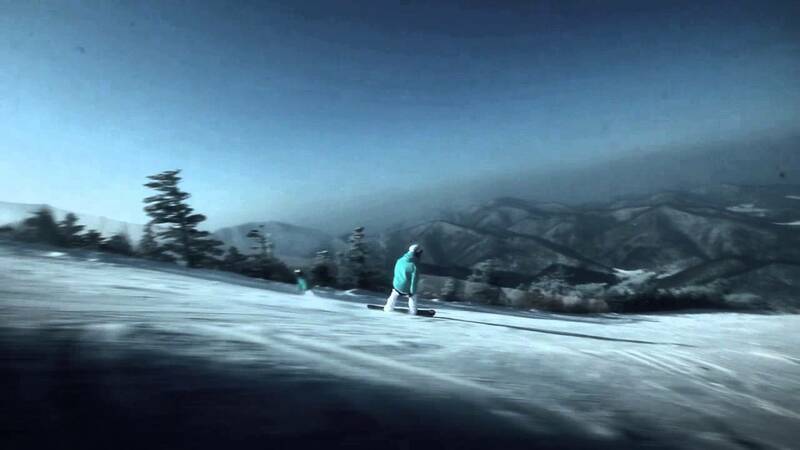 At this ski resort korea we have professional ski tour guides who are able to assist you in your needs. Before you arrive to the Ski resort korea, for your necessary needs we stop by a ski wear rental shop first. We have about an hour before the resort korea opens up so you have enough time to prep yourself by stretching, using the restroom, and to put on your ski outfit. Are you not already excited to start your ski tour? I’ll now explain some tips about the Ski tour gear and how to choose the proper wear. When many people are changing into the ski wear, many people wear the ski pants over their own pants but it would be wise to only wear the ski pants since there is a chance of falling down often and you would want to be able to move comfortably and safely in your wear. This purpose of this ski tour is to help you all to become familiar and accustomed to the proper ski posture. For this to be the case unfortunately you will have to fall often and bump into things. Many people try to wear many layers over their pants because of the cold weather but since the pants already has 2 layers it is already warm enough for you. You would want to wear your ski outfit one size larger than your actual size so you would be able to move more comfortably. Also, those who want to have their pictures taken while skiing, we would recommend you to wear bright colored clothes. If you wear a dark outfit over the white snow it tends to make your face to look darker so, it would be best to wear fluorescent bright colors to allow you face to look brighter and to look more like a professional skier in your pictures. The purpose of skiing is to enjoy yourself. As you enjoy yourself when you are shopping for a brand new outfit. If you done choosing your outfit and wearing it, why not help a friend out to wear an outfit that will match you in your pictures. Instead of this ski tour being just a place to learn how to ski, it can also be a place in helping you and your friend or family to become closer to you. Once you are done choosing your ski tour outfit now it is time to choose the accessories to match what you are wearing. What you have to have when skiing for sure is your glove. If you have forgotten your gloves, do not worry about it. When you are partaking in our ski tour we will rent gloves for free. Once you follow your guide to choose your glove then you can choose a scare, socks, helmet, and other items and other protective gears. Especially we recommend for you to rent a helmet for the safety of the children while they are learning to ski and enjoying the slopes. Falling down on the snow doesn’t really hurt or won’t be too severely injured, but just in case we really recommend the rental of all the safety gears to be used for the children. If you are done choosing all your skiwear, accessories, and gears then, let’s officially start the ski tour…. With the ski tour guide we will head toward the ski resort. The ski resort is only 5min. by foot from the ski tour rental shop. While you are walking don’t hesitate to take out your camera and take pictures with your family and friends. 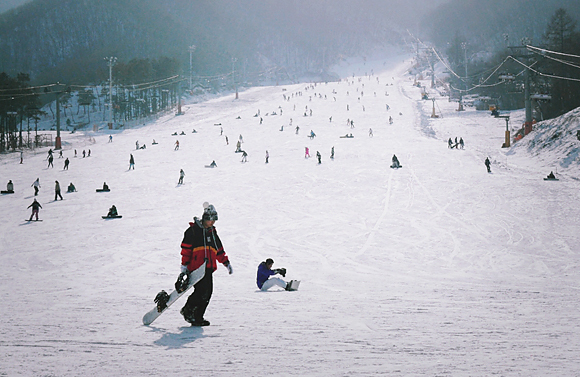 Once you arrived at the ski resort korea the next step is to rent your ski board or skis. After the measurements of each individual feet size are done then you would follow your ski tour guide to rent the gears. The gears are categorized into 3 sections. 1st is the ski plate, which you will need when you are sliding all over the snow. 2nd it is the boots, which plays the role of connecting the plate to your feet. 3rd is the pole, it is used to help for balancing. It is not very easy to move around while carrying all 3 of these gears due to it being heavy. But, you do not need to worry about this, Because while following your tour guide, if you stretch both your arms out, your guide will put all the gears on your arms to help you balance them and carry them out to wear at the end. First put your boots on then store your personal shoes into the locker and then head towards the practice area while carrying your plate and pole. At that moment, what is funny is, once you are moving forward step by step you would feel like a robot as you are walking. If it is your first time wearing the ski boots it would be very uncomfortable. The reason is because the boots are heavy and very tight on the feet. But once you come to the end of your ski tour, you will adjust to the boots as if you could fly in them. The most important thing in a Korea ski tour is the safety of our customers. That is why we enforce a 10min stretching time to be spent with your ski tour guide. So please follow the lead of your guide. Now, we will go into the ski tour training. It could be like a baby learning how to walk at the first time with inconvenience, you will find feeling like your ski gears are one part of your body at the end. You can spend your free time after basic instruction in this ski tour. The place where we did is just a small and short slopes for kids. If you are a fast learner, then you can purchase a 57 dollars lift ticket individually and go up to the top of the slope and enjoy ski tour by coming down in the longer but smooth slope. Otherwise you can just learn the basic skill and posture. Enjoy ski tour until the afternoon and return your ski gears and back to the rental shop where we changed our clothes. And change your ski clothes to your original one at the rental shop, back to the bus and come back to Seoul to end the Korea ski tour. Let’s call it a day! Yongpyong Resort is the oldest ski resort in Korea.The Rainbow Course extends from the peak to the base which is about 5 km. As the longest course it is available to skiers of all levels. 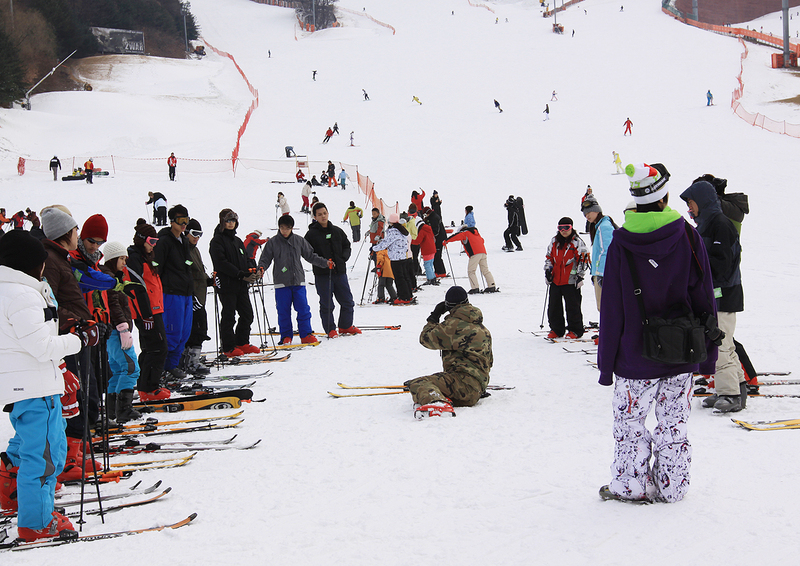 The level of difficulty varies among each course but Yongpyong makes it easy to switch from course to course while skiing down. A 3,742m long Gondola carrying 8 people is operated from the Ski House to the 1,438m peak which is the Rainbow Course. On clear days the East Sea and the whole Mt. Odaesan come into view from here. The scenery is truly the pride of Yongpyong and it deeply impresses its visitors. 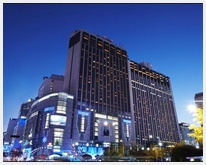 Cosmojin travel has run Seoul daily city tour for more than 15 years. We developed the most attractive tour packages for visitors and will continue to create new programs to meet international traveler’s need. We help you to plan your own Seoul city tour with well-prepared theme and organized time table. You will find the most convenient way to enjoy Seoul with Cosmojin. We hire the best tour guides with good service experience especially for foreigners and they all get great feedbacks from the customers. They are all proud of what they do for visitors to make your every corner of visits memorable and meaningful. Transportation is another important things define travel quality. We provides brand new and clean cars with reasonable price for various tour packages. There is Korean saying "Even a chance meeting is due to the Karma in a previous life." We will serve you as our family and friend as we want you to remember the time with us as a great memory. There are so much fun in Seoul and we cannot wait to introduce all of them. It does not matter morning, afternoon or late night. You will be surprised what you can enjoy in every second. We look forward to meeting you soon. You will enjoy guided tour with interesting secret and meaningful information that you cannot find elsewhere. Aren’t you excited about the best guide, the best customer, the best place and the best tour course?